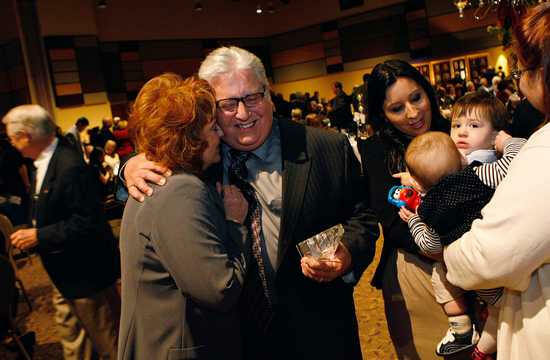 KENNEWICK Convention Center — The 2011 Tri-Citian of the Year award went to a “true patriot.”That is one of the many phrases that were used to describe Skip Novakovich as he was honored Saturday for more than 20 years of service in the Tri-Cities. But Richland’s Novakovich said he could not take credit for the long list of community service efforts that John Umbarger, 2010 Tri-Citian of the Year, had read out loud. Novakovich said the credit for the gifts and service he and his wife, Shannon, have given to the Tri-Cities community should go to God. Novakovich was joined by Shannon and two of their three children as well as grandchildren as he accepted the award to the standing ovation of more than 150 people who gathered at Kennewick’s Three Rivers Convention Center. Umbarger admitted some of them were having a bit of trouble telling if Esprit Graphics, the Kennewick business Skip and Shannon own, was for profit or a nonprofit because the business annually contributes more than $50,000 in graphic design, printing and mailing services to support various community programs and organizations. The nomination letter pointed to Novakovich’s work in opening transitional housing for veterans in Kennewick as an example of how he has tried to help address unfilled community needs. As part of his work as president of the Columbia Basin Veterans Coalition, Novakovich this year helped start transitional housing for veterans. The organization converted a 2,100-square-foot, four-bedroom home that was under foreclosure, and being offered by the city through its Neighborhood Stabilization Program, into veteran housing. A retired Army lieutenant colonel, Novakovich has given his time to more than 26 local committees and groups, including the Benton-Franklin Mounted Sheriff’s Posse, Columbia Basin Badger Club and the Washington State University Tri-Cities’ Signature 2020/Destination 5000 committee. He also is the commission chairman for the Port of Kennewick. His past awards include 1999 Kennewick Man of the Year, Outstanding Partner of the Year with the Kennewick School District, Everyday Hero Award from Kiwanis, Kennewick’s Leadership Award for the Bridge-to-Bridge/River-to-Railroad project and Lifetime Volunteer Award for First Night International. Novakovich and his wife were named Mr. and Mrs. First Night Tri-Cities in 2006 and have been honored with the Downtowner of the Year Award. Skip Novakovich has done a lot for this community. He’s devoted countless hours to the betterment of his beloved Kennewick and beyond. And he’s earned honors and awards for his volunteerism and commitment to civic duty. Accolades aren’t what motivate people like Novakovich to do what they do. But it doesn’t hurt every once in a while to make sure folks who give so tirelessly and work so hard for our community know that they are truly appreciated. Novakovich has been named Tri-Citian of the Year. He’s probably best known for his downtown Kennewick business, Esprit Graphic Communications, which he operates with his wife, Shannon. He’s also serving as president of the Port of Kennewick Board of Commissioners, an organization that’s moving forward with rejuvenating the long embattled Vista Field and the Kennewick waterfront, especially on and around Clover Island. Serving as a port commissioner is a big job in itself. But Novakovich doesn’t stop at being an entrepreneur and public servant. Many, many causes and organizations benefit from his involvement and leadership. A retired Army Reserve lieutenant colonel, he also is chairman of the board of the Columbia Basin Veterans Coalition, a group that’s near and dear to his heart. He has helped create transitional housing for veterans and has supported the Tri-Cities Regional Veterans Memorial Committee and the Time of Remembrance Committee. When arsonists demolished the Playground of Dreams in Columbia Park in 2003, Novakovich stepped in as chairman of the fundraising committee to rebuild the playground and was part of the remarkable effort to resurrect the playground in four days the following year. The campaign was so successful, there was money to spare in the fund when the playground was completed. Novakovich has been active in downtown Kennewick for years, literally helping to change the look of the district with efforts to create the flag plaza and involvement in the facade improvement committee, which has helped several business owners improve the look of their stores. He also helped develop the family-friendly First Night Tri-Cities celebration. Novakovich doesn’t just give of his time. He also gives back through his business, donating thousands of dollars of graphic design and printing work to community organizations each year. His interest in current events and healthy debate brought him to be a founding board member of the Columbia Basin Badger Club. The list of good deeds by Novakovich is long, as is the list of honors bestowed on him for his service. As Tri-Citian of the Year, he joins a long line of distinguished folks who have helped make our community a better place to live and work. None is more deserving than this year’s honoree. Congratulations, Skip.